While you watch from a safe distance. Forget the diet, welcome to Cornwall. Our Pasties are proper Cornish, delivered fresh from Blakes Bakery in Liskeard,. Established in 1979, all their bread, cakes and pasties are made on the premises in Dean Street. Totally authentic Cornish pasties. 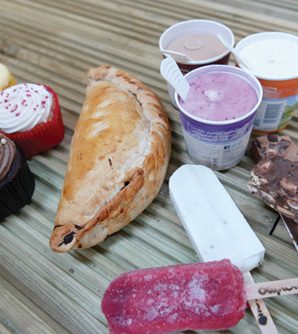 The Cornish Ice Cream is made by the Parker family at Callistick Farm, where they've been at it for 25 years. They have their own cows, use their own milk, and add no artificial ingredients. Yummy. Order pasties, chips and drinks when you book online. You'll need them: it's thirsty work. Great tea, fresh coffee and cold drinks in the fridge. Perfect. Lay a blanket down by the water. Picnic on the cliffs or out on the lake pontoon. Find the world’s smallest beach, dive off the floating platform or just sit on the edge and dip your toes in the water. The Lake and lawn are for Adrenalin Quarry customers, we give this part of The Quarry a lot of love and keep it really nice. We need you to respect that, so come on in, have a good time, be kind to the people around you and please take your trash with you. See you down there.